HYDERABAD.APR.13: The J.S.P.S. Govt. Homoeopathic Medical College and D.K.Govt. 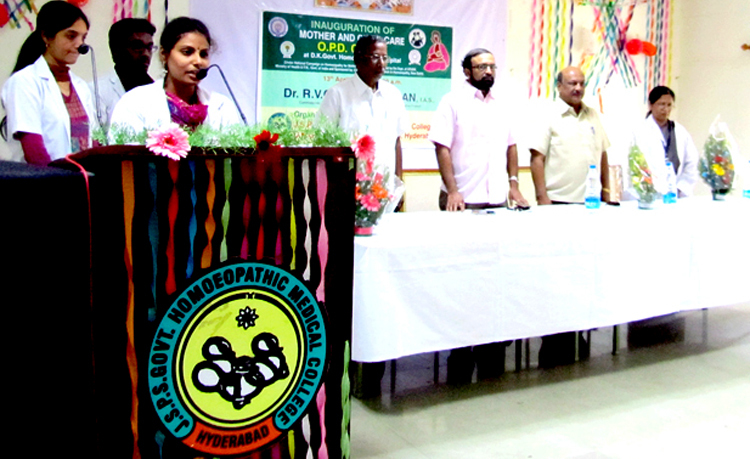 Homoeopathic Hospital, Ramanthapur, Hyderabad had organized 12 Community Awareness Camps and launched a Mother and Child Clinics. The doctors and interns have visited rural, urban and slums and conducted the homoeopathic camps. The Mother and Child Clinic was inaugurated at the college by Dr.R.V.Chandravadan, I.A.S, Commissioner Dept. of AYUSH. The Ultra Sonography machine was inaugurated by Dr.Mallu Venkateswarlu Additional Director (Homoeo). Dr.M.Gopal Krishna, Coordinator, Dr.C.Yamuna, Chief Medical Officer, Dr. G. Srinivasulu, Program Officer, Dr.S.Praveen Kumar, Member and Dr.Ch.Srinivas Reddy, Member, Mother and child Care and Dr.Shahid Ali, C.C.R.H. participated in the programs. The I.E.C. materials in Telugu were distributed to the mothers and children. One camp was exclusively conducted for the mentally challenged children. 2, 336 children and mothers were treated in these camps and given homoeopathic medicines. The Central Council for Research in Homoeopathy has undertakes immense steps to implement the National Program on Homoeopathy for Mother and Child Care.